Some days ago I was waiting for my usual bus to go to work and suddenly I saw an unusual poster at the bus stop. Among the various ads for concerts, discos, local markets and missing cats, I saw the unmistakable… green leaf symbol! 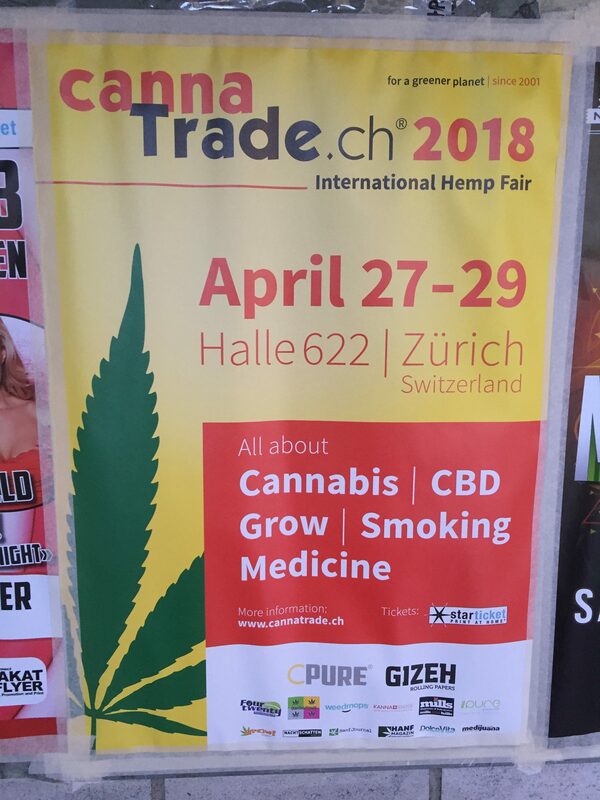 And, as they proudly say on cannatrade.ch, the oldest hemp fair in Europe! And all this just in the well known, top modern, economic centre of Zurich! As a conservative man, I find this fair quite provocative. In a world where drugs or soft drugs are still debated and often forbidden, Switzerland is (strangely) very permissive and open. Think about: Zurich is the third city in Europe for cocaine consumption (as reported by “Ticino online” already in December 2016). In Switzerland are the top priorities and worries perhaps focused on showing a clean city, rather than really fighting the drug consumption and addiction? Smoke weed, take drugs… but please, hide yourself and do not show it to us!